OK, let’s break the rules and get straight to the point – ‘Among the Ghosts‘ is a very good album. No need to read through, or (heaven forbid) even skim over a few hundred words describing the songs, the background to the music to get to the summary. No sirree! Here at Americana UK rules were made to be broken, so here it is again, right up front and in your face. This is a very good album. With that out of the way, it’s back to normal service. ‘Among the Ghosts’ is Lucero’s 9th studio album and after 20 years together they are showing no signs of slowing up and are still making mighty fine music. Under the expert production and engineering leadership of Matt Ross-Spang (of Jason Isbell and Margo Price fame), they have returned to their roots and crafted an album of 10 excellent tracks that are an engaging blend of the type of blue collar, hard-driving gritty rock that you can expect to experience at their live concerts. It was April 1998 when Lucero made their first appearance on stage in Memphis and there is no doubt that their music has developed and matured through the intervening years. ‘Among the Ghosts‘ sees the band return to a cleaner sound, one that shuns the need for horn sections and overly complex arrangements for a vibe that, while it’s somewhat stripped back, manages to pull off the neat trick of being somewhat darker both lyrically and musically, and there is little doubt that it’s all the better for it. It’s clear too that since the birth of his daughter 2 years ago, frontman and co-founder Ben Nichols has a different outlook on life and there is a recurring theme throughout the album that ponders the uncomfortable hardship of family separation that is an almost inevitable outcome for a touring band member. A perfect example of this is found in ‘To My Dearest Wife‘. On the surface it’s a tale of a soldier deeply missing his wife and daughters while contemplating his uncertain fate at the next morning’s inevitably bloody battle, but in reality it’s Nichols writing and singing of the pain of having to hit the road and leave his own wife and young daughter behind. A really clever aspect of this song is Nichols’ use of the first verse from the ‘Battle Hymn of the Republic‘ (Mine Eyes Have Seen the Glory) in the bridge of the song, very skillfully anchoring the track to a distinct place and time – the American Civil War. There isn’t a bad track on ‘Among the Ghosts‘ and its blend of driving rhythms, high-quality musicianship inventive lyrics combined with Nichols’ gravelly vocals keep you engrossed from the first track to the last. 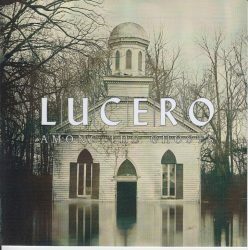 If you’re not familiar with Lucero, then ‘Among the Ghosts‘ is as good a place as any to start.